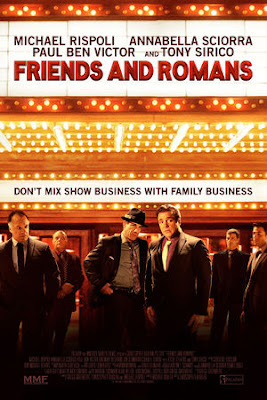 James Verniere at the Boston Herald offers a good piece on Friends and Romans, a film that I look forward to seeing. Friends, Romans and fellow fans of “The Sopranos” will get a kick out of “Friends and Romans,” a Staten-Island-neighborhood-set low-budget but winning and very well-cast comedy about a group of Italian-Americans who have worked as extras for many years and get a chance to mount a production of Shakespeare’s “Julius Caesar” at a local theater. Their leader is hard-working family man Nick DeMaio (film, TV and “Sopranos” veteran Mike Rispoli). Nick is a seasoned extra, who has been repeatedly cast as “Gangster Number 3” in films and dreams of having lines to speak in front of a genuine audience. The screenplay, co-written by Rispoli, producer Gregg Greenberg and director Christopher Kublan (“Giving It Up”), was obviously penned by people fond of showbiz spoofs and of actors. Nick and his fellow frustrated, extra buddies Dennis Socio (TV veteran Paul Ben-Victor), Joey “Bananas” Bongano (“Sopranos” veteran Anthony DeSando), Bobby Musso (the one and only Paulie “Walnuts” Gualtieri, aka Tony Sirico) and Frankie Fusso (Tony Darrow, “The Sopranos”) are hardly Shakespeare-ready. But they are game and they have a dream.